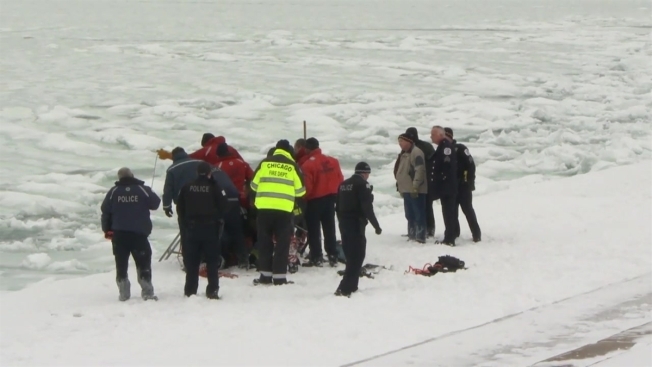 A person was pulled from a deathly-cold Lake Michigan Friday after Chicago saw one of the worst snowstorms to hit the city in years, officials said. A passerby called the Chicago Fire Department about 3:40 p.m. after they saw the male victim in the water near the 3200 block of Lake Shore Drive on the city’s North Side. Multiple fire department and police personnel arrived on scene to begin the difficult process of pulling the person from the water, Ron Dorneker, deputy chief of Marine and Dive Operations for the fire department said. Dorneker told reporters the person was rescued from the water and then dragged in a sled-like device over the inches-thick snow to a waiting ambulance. He was then transported to Presence Saint Joseph Hospital in extremely critical condition.